In May 2012 a hydrogen fuel storage tank in Emeryville, California ignited. While the resulting fire quickly burned itself out and injured no one, the incident sparked public concern over hydrogen fuel safety. That fire underscored the central argument of hydrogen skeptics: hydrogen is too unstable and unsafe to be used as fuel for public transportation. As a transit operator, your mission is to keep passengers, fellow operators and the general public safe. It’s natural to wonder if these concerns over hydrogen fuel are correct, or if public fear is preventing operators from harnessing an abundant clean energy source that could power our public transit systems. There are inherent risks handling any flammable gas or liquid, including traditional gasoline. When used in accordance with proper guidelines, hydrogen fuel is safe for public transportation. More than a century of gasoline reliance has bred a natural public familiarity and comfort with this fuel. Yet gasoline is far more flammable and dangerous than hydrogen fuel. When petrol or diesel fuels leak, these fuels pool close to the ground, increasing ignition likelihood. When ignition does occur, it can result in a dangerous and long-lasting fire. Between 2004 and 2008, 1 in every 13 conventional service stations experienced a fire. In contrast, between 2007 and 2010, the US Department of Energy has only recorded one hydrogen fueling station incident resulting in an ignition (the Emeryville incident) and no injuries or fatalities have been recorded. If a leak in a hydrogen tank or fuel cell were to occur, the gas disperses rapidly, rising upwards at a speed of 72 km/hr, minimizing the likelihood for ignition. In the event that hydrogen does ignite, hydrogen flames generate a low radiant heat due to the absence of carbon and the fire will quickly burn out. Another concern raised by critics is that hydrogen is a colorless, odorless gas: how will operators know if a leak has occurred? Strict safety measures govern the operation and fueling of hydrogen vehicles, limiting the risk for leaks and potential ignition. Buses are equipped with hydrogen detectors to immediately detect if a leak has occurred. Should a leak be detected, vehicle operators can push the emergency stop button and immediately switch off the fuel cell system. Like all fuels, hydrogen should be handled responsibly. 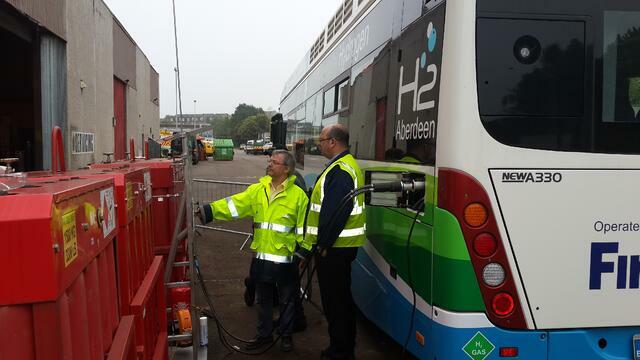 Bus operators receive required training on correct refueling procedure at hydrogen refueling stations. This includes using an “earthing cable” during refueling, which prevents sparks caused by static electricity. Hydrogen refueling in Aberdeen, Scotland. Hydrogen, like CNG and any combustible fuel, is not without risk. However, the risks associated with using hydrogen are far less than conventional gasoline and CNG. Furthermore, the upside to using hydrogen over conventional gasoline is substantial. Hydrogen is the most abundant element in the universe and a renewable energy source. Thanks to its high energy density, hydrogen can power heavy-duty vehicles and meet zero-emission requirements, lower air pollution in congested cities and the health risks associated with fossil fuel related smog. Even though the use of hydrogen to fuel vehicles is relatively new, hydrogen has been used, transported, and stored safely in industrial applications for decades. Ballard’s hydrogen-fuelled fuel cell buses have traveled millions of kilometers in varied environments around the world, safely transporting thousands of passengers. 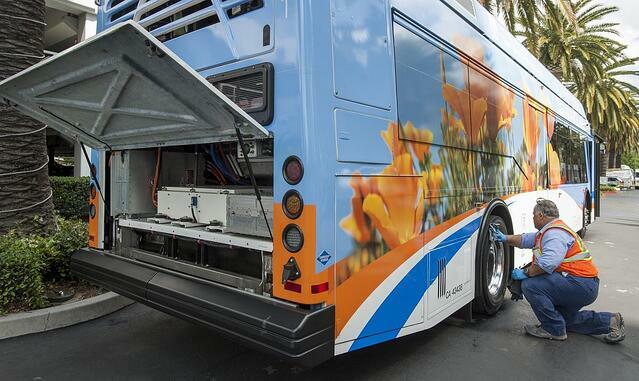 The use of zero-emission, renewable energy sources for public transportation is a contemporary imperative. Don't let unfounded hydrogen fuel safety concerns prevent your city from reaping the benefits of this clean, renewable energy source.